When it comes time to make a luxury SUV purchase, it is important to know that you have options outside of frivolously expensive premium car brands. While we are sure that the SUV models from names like Mercedes-Benz, BMW, Audi, and Volvo are very nice, we aren’t entirely sure they are worth their high price tags. Chevrolet offers an exceptional lineup of award winning premium SUVs that aren’t going to break the bank. If you want all the frills, amenities, technology, and advanced safety features on the market, look no further than the 2017 Chevrolet lineup. Before you head out to one of the luxury car dealers to buy your premium SUV, take a look at what the all-American bowtie brand has to offer. Chevrolet offers buyers plenty of options to choose from when it comes to picking out a vehicle that will work with their lifestyle. From subcompact cars, to powerful pickups, to full-size SUVs – Chevy engineers certainly know what they are doing, and they do it very, very well. Take a look at two of the auto manufacturer’s largest and most premium SUV offerings, and see what each one brings to the table for the 2017 model year. 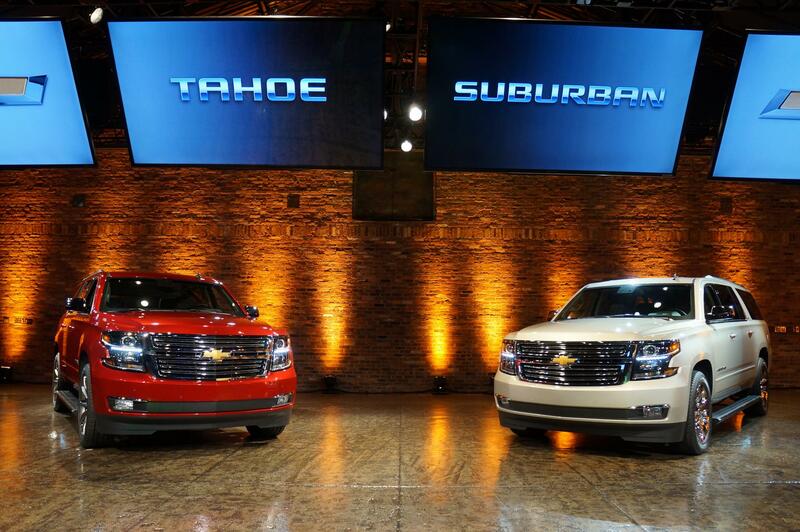 2017 Chevy Tahoe: The Tahoe was first brought to dealerships across the United States for the 1995 model year, and has been one of the brand’s best selling nameplates ever since. A smaller version than the larger Chevrolet Suburban, the Tahoe was designed to appeal to large families who weren’t keen on driving such a bulky vehicle. The Tahoe has enjoyed several updates and redesigns over the years, but the 2017 Chevy Tahoe is one of the most impressive versions of the full-size SUV ever manufactured. Touching on everything that matters to buyers in the premium SUV market, the Tahoe is much more than a worthy contender for those considering an upgraded family car for the upcoming new year. Starting at $47,215, the newest Tahoe full-size SUV boasts impressive stats like 355 horsepower, 23 miles per gallon on the highway, and an available 4G LTE Wi-Fi connectivity. As America’s best selling full-size SUV for the past several years, recently named the Highest Ranked Large SUV in Initial Quality by J.D. Power, it is no wonder why drivers are turning away from luxury name brands, and trading them in for Chevrolet’s award-winning Tahoe. Featuring high-end technology like a push-button keyless start, 4G LTE Wi-Fi connectivity, Apple CarPlay, Android Auto, multiple power outlets throughout the cabin, and an optional rear Blu-Ray entertainment system, there is nothing that the 2017 Tahoe doesn’t offer. An acoustic laminated windshield means outside road noise stays where it should, leaving passengers in quiet serenity for the duration of their travels. Fold-flat third row seats with an available power-release control, mean that regardless of what you need to bring along for the ride, your Tahoe can more than handle it. The 5.3-liter V8 engine delivers 355 horsepower and 383 lb.-ft. of torque, and is capable of towing up to 8,600 pounds. Whether you need help bringing your boat up to the cabin for the weekend, or are bringing the cabin with you, the 2017 Chevy Tahoe can complete the task with ease and refinement. 2017 Chevrolet Suburban: The Chevy Suburban isn’t just a longstanding member of the Chevrolet lineup, but also happens to boast the title of longest running nameplate in automotive history. No other car, truck, or SUV has been in production for as many consecutive years as the Chevy Suburban, and it all started back in 1935 when the bowtie brand first introduced the full-size SUV. Currently in its twelfth generation, the iconic Suburban is one of the most premium SUVs in its segment, available at a mainstream price. Starting at $49,915, the 2017 Chevy Suburban is the epitome of convenience, comfort, luxury, and class. Featuring the same 5.3-liter V8 as the Tahoe, the 2017 Suburban also produces 355 horsepower, 383 lb.-ft. of torque, and can tow up to 8,300 pounds with ease. An obviously capable SUV, the Suburban offers so much more than the power and performance it is well known for providing. Automotive luxury has long been defined by posh leather upholstery, real wood trim accents, and hand stitched surfaces, but with the advent of advanced in-vehicle technology, the definition of luxury has shifted to keep up with the changing times. With available built-in 4G LTE Wi-Fi connectivity, the 2017 Chevy Suburban transforms into a mobile hotspot wherever it happens to go. With Apple CarPlay and Android Auto compatibility, you will be able to navigate your Suburban with confidence knowing that your eyes are on the road, and your hands on the wheel at all times. With seating for up to eight passengers, and up to 14 charging locations around the interior cabin, every one of your traveling companions will remain happily connected no matter where your adventure takes you. Power folding rear seats transform your Suburban into a storage paradise, with up to 121.7 cubic feet of space for all of your cargo needs. While packing in all of your luggage for a long expedition is important, the small things matter just as much. That is why Chevy incorporated effective storage solutions throughout the Suburban’s large interior cabin, such as door-mounted water bottle holders, small bins for personal items, and even a front center console capable of storing a laptop computer. Whatever your storage needs happen to be, the 2017 Chevy Suburban can accommodate them. Before you go back to your luxury automotive brand for your next family SUV, consider coming down to DePaula Chevrolet in Albany, New York, and discover the Chevy Suburban and Tahoe. Each of these unique full-size SUVs has plenty to offer, and you will be surprised by how extensive the personalization of each of these models is. Whether you are seeking a full-blown luxury family SUV, or a more practical family car with a few premium upgrades, there is a Chevrolet Tahoe or Suburban that is the perfect solution for you. Come down to the name Albany residents have trusted for years, and take the Chevy SUV lineup for a test drive. You won’t be disappointed.